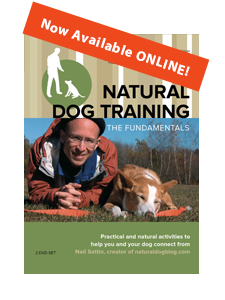 Welcome to the Natural Dog Blog, the most complete and practical resource for Natural Dog Training on the web. This site will help you learn about the philosophy and practice of Natural Dog Training, elicit obedience from your dog, and solve problems like dog aggression and hyperactivity. Through the techniques of Natural Dog Training (developed by Kevin Behan), you will learn how your dog actually sees the world (or rather, how your dog feels the world), and develop a thorough understanding of how a dog's prey instinct is at the core of all of their behavior. Rather than fighting your dog's natural instincts, you will discover how to work with them, so that your dog will respond to you even at increasing levels of energy and stimulation. Natural Dog Training will transform your relationship with your dog, fostering a deeper emotional connection based on satisfying your dog's innermost desires. Subscribe - If you're new to this site, the first thing that you should do is subscribe (see the link in the upper left hand corner? you can subscribe with e-mail or RSS). Subscribing will ensure that you get blog articles when they're written - delivered to your newsreader or Inbox. Training How-To - Go to this section to get a (reasonably) ordered presentation about how I train dogs, and how YOU can start implementing the same Natural Dog Training-based style that I use. Blog - Here's where you'll find the most current articles that I'm writing about all things "Natural Dog". The latest and greatest info is here. You can also click on the "Archives" and see all of the articles I've ever written here on the Natural Dog Blog, in reverse chronological order. Store - I have a couple essential items for you here in the store. The first is my DVD set, which gives you in-depth visual instruction in the dog training methodology that I use. You'll see many of my techniques with different types of dogs, so that you'll have a sense of how to do this kind of training work with your own dog. I also sell extra-long (50 foot) nylon training leashes - specially designed to be durable, visible, and enable you to have control over your dog, at a distance, while you play or train. Forum - People are talking about Natural Dog Training. Come join in! Get your questions answered, meet others, become part of the community. With the tips contained in this site, you'll become the center of your dog's emotional universe (aka "the moose"), and then you'll be able to easily elicit rock-solid obedience - teaching your dog how to heel, sit, lie down, stay, and, most importantly, come when called no matter what the distraction. You'll solve difficult problems like aggression, anxiety, fearfulness, or hyperactivity by learning what's at the core of these behaviors and addressing them at their root. The best part is that no matter what you do, you will have fun doing it! My goal is to help you learn how to be the moose and have the happiest dog on the block. You might just end up being the happiest human on the block as well.